Today we’ll be watching MGM’s 1949 film, Neptune’s Daughter, starring Esther Williams, Ricardo Montalban, Red Skelton, and Betty Garrett. 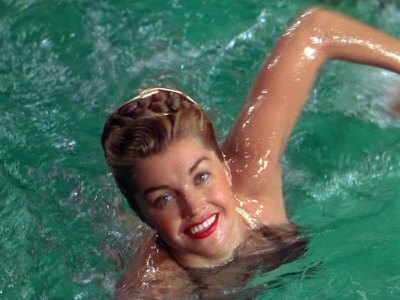 You remember Esther Williams, don’t you? Competitive swimmer turned movie star? You may have noticed one of the song clips in the trailer as being “Baby, It’s Cold Outside.” Frank Loesser sold the song to MGM to use in the film, after having initially writing it in 1944, performing it at parties he’d host with his wife to let people know it was time to go home. It would win that year’s Academy Award for Best Song. The movie also features Mel Blanc in the character role of Pancho, a Latin stable hand, using a voice similar to the one he would use a few years later for Speedy Gonzalez. No joke. Enter/Ride-in-on-a-horse Ricardo Montalban as Jose O’Rourke, captain of the South American polo team. He’s athletic, dashing, and of course (since he’s Latin), one hell of a lover. Which is good, because he’s around to give advice to massage therapist Jack Spratt (Red Skelton), who has no idea how to get a girl. Jose tells Jack how to hold a woman, and how to talk to her–in Spanish. “It is the language of love.” After an incident of physical comedy, Betty finds Jack unconscious, mistakes him for being Jose, and gets him to agree to coming over to her apartment that night for a date. I don’t know if you should proposition people when they’re unconscious, but it’s a movie musical, so never mind. That night, Betty makes sure that Eve is out of the house, adds extra hot sauce to the h’orderves (“They like it hot.”), and waits. Jack shows up, ready to play off being Latin to the hilt, and attempts to woo Betty with a Spanish for Beginners record. After putting out the fire in his mouth, Jack takes Betty to a Spanish Club that Xavier Cugat and his orchestra play at. Jack accidentally talks his way into playing with the band, and Betty sings a song about how much she loves men who play percussion instruments. The next day she tells her sister all about how the captain of the polo team took her out. Eve is convinced her sister is being took and decides to nip this whole business in the bud. She sends for Jose, and of course the real one shows up and is taken by Eve’s unreal beauty. She asks him not to see her sister again. He consents, never bothering to explain fully that he’s never met her sister, but makes the condition that she go out with him instead. She reluctantly agrees, and spends the evening being as platonic and boring as possible. Finally, Jose attempts to woo her by singing “My Heart Beats Faster” at the stables. Here is some of the most awkward couple dancing I’ve ever seen in a movie musical–Esther Williams is more graceful in water than on land. Sadly, there is no Youtube clip I could find of this. But trust me, it’s true. At the club, Eve and Jose encounter many other women on the dance floor who seem to have known the man before. Eve doesn’t feel so special, and leaves. But it all works out, obviously. To be honest, aside from the extended water ballet number at the end of the film (which is not the best one ever) and a BRILLIANT sequence where Red Skelton tries to get on a horse, there’s not a lot of substance to the film. Jose’s character never really tries to figure out why he’s being mistaken for having taken out Betty, and for some reason the writer of the film thought the best way to button this whole thing up would be with a kidnapping subplot. Yes: kidnapping. There are really only four songs with lyrics in this movie, and since one of them is “Baby, It’s Cold Outside,” your options are pretty limited. In fact, I’d say the only thing that is worth looking at is “My Heart Beats Faster,” for any Frank Loesser/musical set in the ’40s male-lover role. And it looks like you may need to get that song transposed, because the sheet music for this song is very illusive. That’s all for now. Stay cool, and Happy Movie Musical Monday!